Model No. 99DSPT. 14in (36cm) Steel Cable Gun Lock with 1-5/16in (33mm) Wide Laminated Steel Body Padlock; Keyed Alike in sets of 4. Best Used For: Guns, Hunting&Shooting Equipment. Product Features 1-5/16in (33mm) Laminated steel body for superior strength 14in (36cm) Steel cable resists cutting 4-pin tumbler cylinder helps resists picking. Dead-locking, anti-rap mechanism defeats physical attacks Vinyl covers on lock and cable prevent scratching. 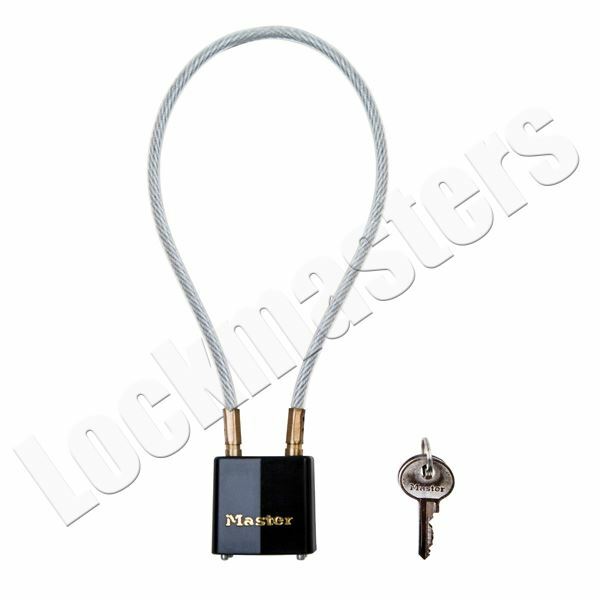 Product Details: The Master Lock No. 99DSPT Cable Gun Lock is 14in (35cm) long and is made from braided steel for maximum strength and flexibility. The padlock features a 1-5/16in (33mm) wide laminated steel body for maximum strength and reliability. The Limited Lifetime Warranty provides peace of mind from a brand you can trust.